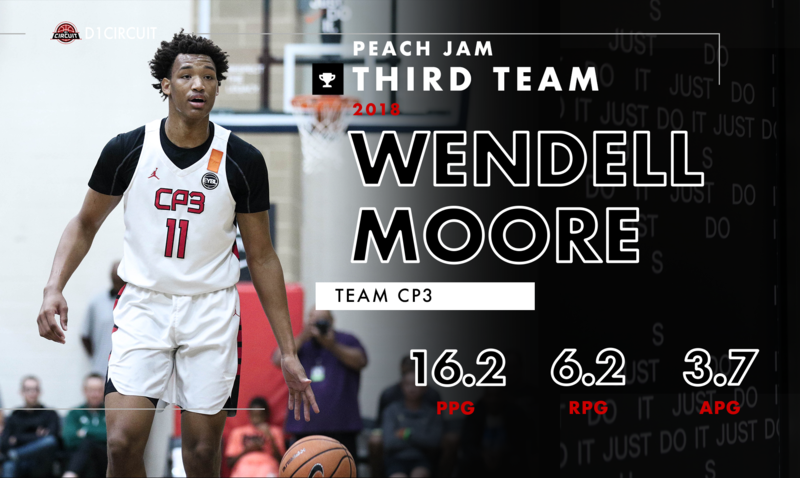 Death, taxes and Wendell Moore making an all-tournament team. 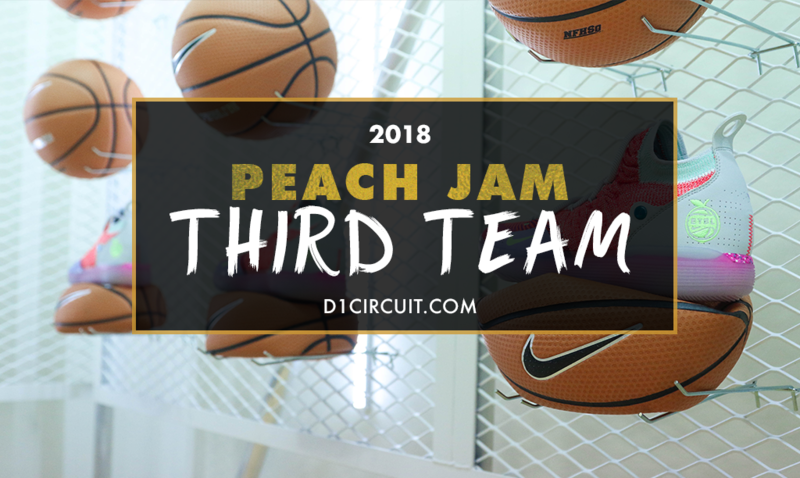 Team CP3's do-it-all rising senior was up to his usual tricks in North Augusta, putting together one of the most complete statistical lines at Peach Jam. CP3 avenged their winless Peach Jam from a year ago, advancing to the Peach Jam quarterfinals behind their longtime stud. Moore literally does it all on the floor, and is going to make one college fan base extremely happy when he eventually makes his decision. 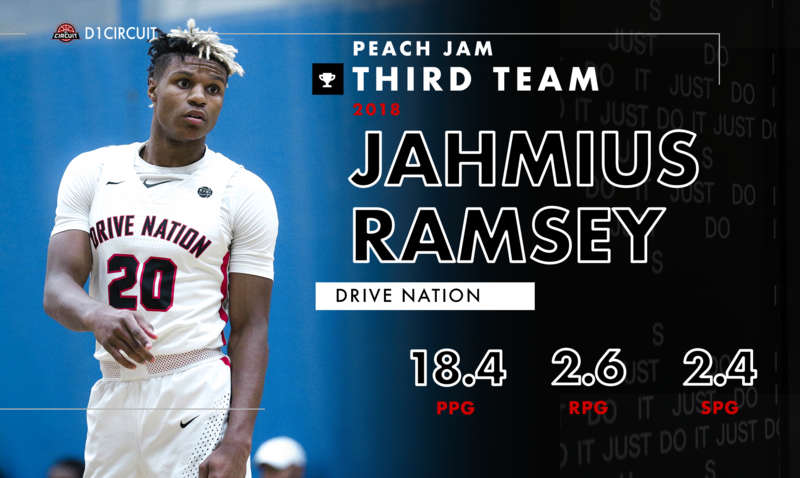 Jahmius Ramsey saved his best for last, turning in his most impressive session to date at last week's Peach Jam. The 6-foot-4 combo guard is built like a truck, and his aggressiveness was on full display in front of the nation's top college coaches. Ramsey shot the ball with much-improved efficiency, including a red-hot 48.1 percent from behind-the-arc. Ramsey improved his offensive output, but maintained his relentless defense, tallying 12 steals over five pool play games. Ramsey will star for national powerhouse IMG Academy during the high school season, and it's very unlikely we've seen the best from the Dallas native. 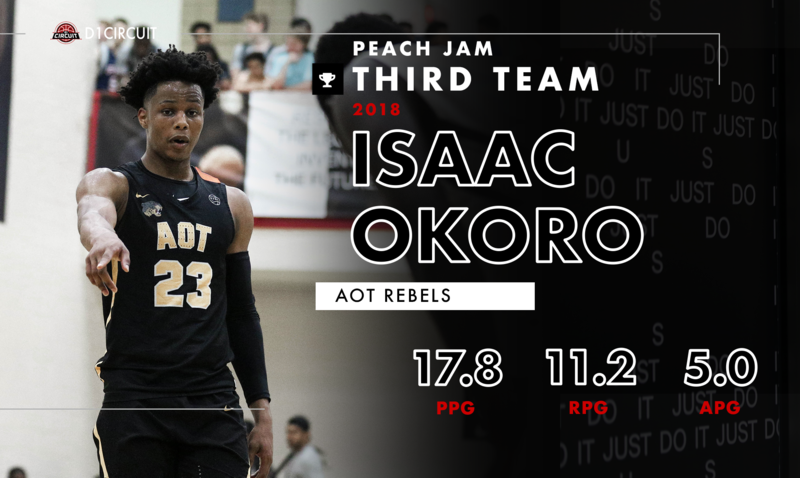 All you have to do is glance at Isaac Okoro's stat-line to understand how instrumental he is to AOT. The 6-foot-5 swingman was a man amongst boys on the boards, averaging 11.2 rebounds while employing a relentless motor. Okoro is one of the best passers on the circuit, utilizing his size and floor vision to set his teammates up. The McEachern (GA) high school star offers elite versatility, and if he can improve his perimeter jumpshot, he won't have a weakness in his game. 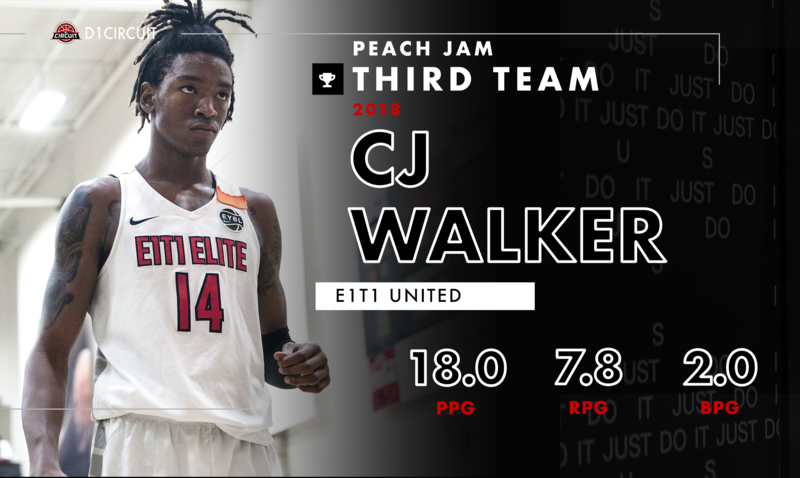 CJ Walker earned 3rd Team All-EYBL during the regular season, and he's back in the same spot after Peach Jam. E1T1's big man was electric for head coach Steve Reece and company, averaging 18 points and eight rebounds while being a menace on defense (2.0 BPG, 1.6 SPG). Walker is blessed with freakish athletic ability, and he pairs it with a non-stop motor on both ends of the floor. Walker is blowing up on the national radar, and the 2-Time Defending State Champion MVP should have an outrageously good senior season at Orlando Christian Prep (FL). 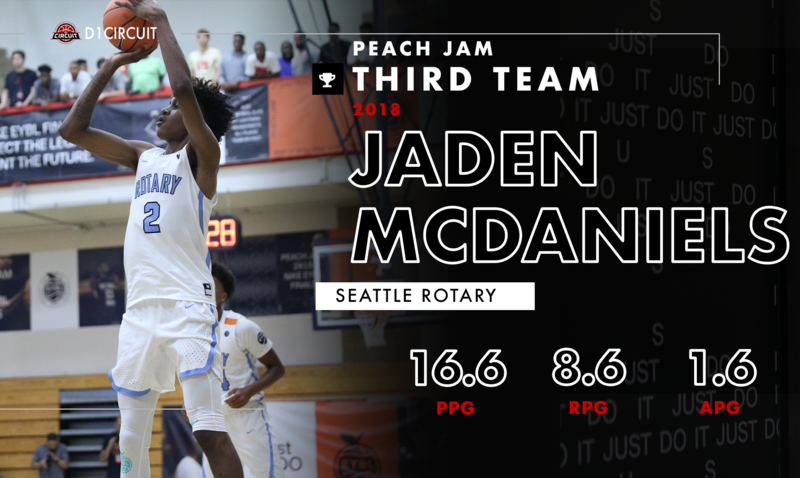 Seattle Rotary showed well for themselves during their first Peach Jam since 2012, and Jaden McDaniels showed the world why he's considered a top-five player in the country. Rotary's swing man took turns playing point, displaying guard-skills behind a long, lanky 6-foot-10 frame. McDaniels is only scratching the surface of his potential, but his Peach Jam output was more than good enough to warrant recognition. Expect McDaniels' recruitment to pick up in a big way, as blue bloods will undoubtedly be fawning over the Federal Way (WA) high school product.